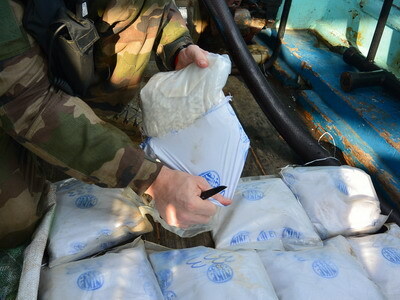 The French frigate FS Floreal struck twice in 24 hours to seize over 7000kg of hashish, valued at $3.5m, from suspicious dhows off the Horn of Africa. This is most significant seizure of illicit drugs in the Indian Ocean since the Royal Saudi Naval Force took over command of CMF’s Combined Task Force (CTF) 150 in August, Combined Maritime Forces said on 26 September. On 23 September, the first fishing dhow was spotted behaving in a suspicious manner. FS Floreal conducted a boarding and discovered 3900kg of hashish, which was confiscated and later destroyed. Barely a few hours later, FS Floreal’s helicopter detected another fishing dhow behaving suspiciously. Once again, the crew conducted a flag verification boarding and let loose Max, the ship’s sniffer dog. Max was quick to sniff out another 3500kg of hashish, which was promptly seized and later destroyed. The South West Monsoon season has run for several months now, creating huge waves and swell, making it difficult for the dhows to make their drug runs. Now that the sea state has diminished, CTF150 warships are poised and ready to intercept the drug runners once again. CTF150 have seized and destroyed more than 1500kg of heroin and over 40 000kg of hashish in the last 12 months. Profits from the sale of narcotics is a known source of funding for terrorist activities. The Royal Saudi Navy assumed command of CTF150 last month.